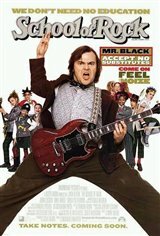 Hell-raising guitarist Dewey Finn (Jack Black) is anti-establishment to the hilt, irreverent to the max, and he worships the power of rock and roll. With a penchant for stage-dives and 20-minute solos, Dewey is determined to lead his rock group to victory at the local Battle of the Bands... but his band mates fire him instead. Down-and-out, in need of rent money and wallowing in his apartment strewn with take-out containers, Dewey picks up a phone call intended for his roommate Ned (Mike White), and impulsively accepts a job as a substitute teacher at the prestigious Horace Green Elementary School. There, by-the-book Principal Mullins (Joan Cusack) watches his every move like a hawk. But while Dewey might not know how to teach, he does know how to inspire confidence in his fifth graders. And when he accidentally overhears them performing in an orchestra class, he decides to mold these young musical prodigies into a high-voltage rock band, which will change their lives forever.